You go, girl! Thanks to your brave words, morale is high among the English, and thanks to England’s crap weather, naval conditions on the Channel are unfavorable for the Spanish. The English navy therefore reigns victorious in this battle and is regarded as the world’s most powerful. 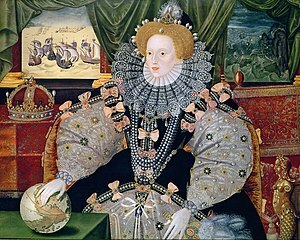 In addition to being a brilliant public speaker, Elizabeth I is politically savvy. She’s able to maintain dominance as the monarch yet remain respectful of Parliament, and she’s strategic in manipulating situations to her advantage. She garners the great devotion of her advisers and public alike and perpetually refuses to marry, despite a close relationship with Robert Dudley, Earl of Leicester. According to her, she is already married to England. Reigning to the very end with dignity during a flourishing cultural period for England, Queen Elizabeth I dies at the age of seventy. With no heir of her own, she leaves her throne, interestingly enough, to the heir of the very cousin she had executed: James VI of Scotland, son of Mary, Queen of Scots. Thus ends the Tudor dynasty and ushers in the House of Stuart. Related London sightseeing: The tombs of Elizabeth I and Mary, Queen of Scots inside Westminster Abbey.